Im Ozy from Indonesia. first of all i want to thank you for this product are available in my country. i have aerodrums since 2 weeks ago and satisfied so far. but i have a major problem for midi notes that aerodrums sends and that problem always on hi-hat midi. 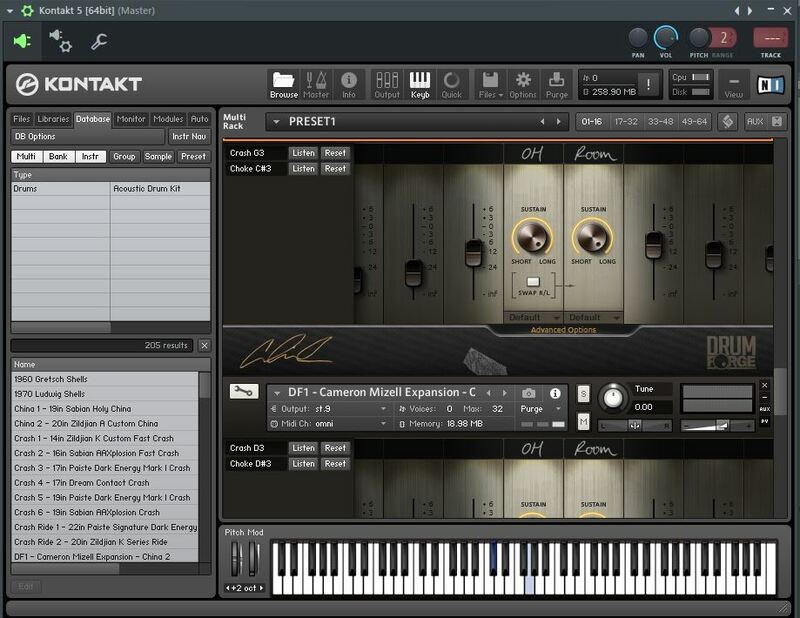 and just now i try to send midi note to Drumforge (with Kontakt). and my biggest problem is when i hit the hi-hat the notes are not working. and im so confused because hi-hat sounds trigger by 15" crash (i already edit midi maps 15 crash to C#2). i already try to edit midi maps manually but still not working. beside of this problem all elements are fine! please tell me how to fix it. i really happy if i can fix it. Thank You mr Richard. You should also make sure that "Open or closed only" is not checked on the Aerodrums MIDI screen. Can you confirm you have everything set up like this? I would expect it to behave well if you had. Regarding Drumforge, could it be the case that you're hearing a crash when hitting the hihat because Drumforge triggers a crash when it receives a D0 note and you have this assigned to the hihat (judging by your screenshot)? I can't find the Drumforge manual online so I'm not sure what the various hihat articulations on the left of your screenshot mean. Normally there is an articulation that will look at the hihat continuous controller (CC4) value to determine the hihat openness. For example, in Studio Drummer for Konkakt this articulation is called "OPEN CONTROL" but I don't see anything like that in your screenshot. 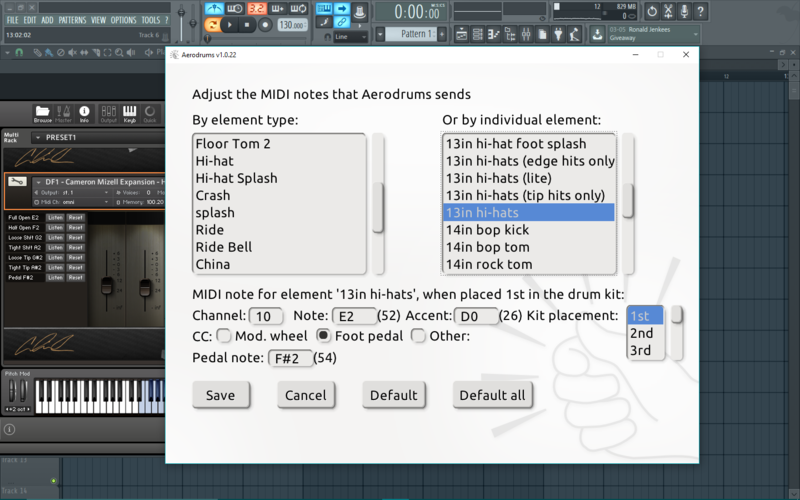 In Aerodrums, could you try assign A#2 to both the 'Note' and the 'Accent' fields for the hihat and see how it behaves. Instead of A#2 you can also try G#2 or A2. Also, again, make sure that the "Open or closed only" is not checked on the Aerodrums MIDI screen. If you can describe the resulting behaviour to me we can hopefully figure out how to fix it. 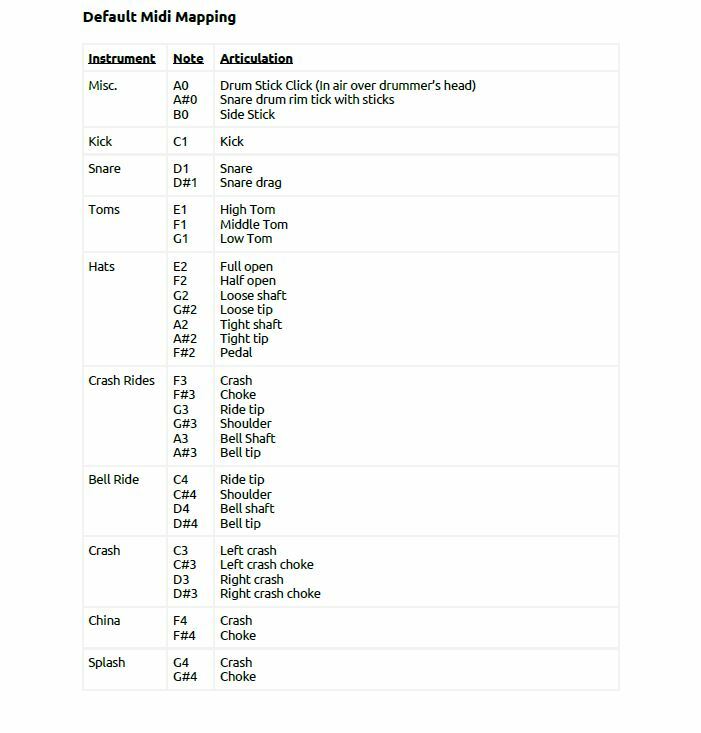 Richard wrote: Regarding Drumforge, could it be the case that you're hearing a crash when hitting the hihat because Drumforge triggers a crash when it receives a D0 note and you have this assigned to the hihat (judging by your screenshot)? no sir, the hihat completely silent. Richard wrote: In Aerodrums, could you try assign A#2 to both the 'Note' and the 'Accent' fields for the hihat and see how it behaves. Instead of A#2 you can also try G#2 or A2. Also, again, make sure that the "Open or closed only" is not checked on the Aerodrums MIDI screen. If you can describe the resulting behaviour to me we can hopefully figure out how to fix it. when i assign E2 to 'Note' the hi-hat is always open. and when i tried to assign A#2 to both the 'Note' and the 'Accent' hi-hat is always closed. the pedal hat is working but if i hit with my pedal closed the hi-hat sounds opened. ozyhasari wrote: when i assign E2 to 'Note' the hi-hat is always open. and when i tried to assign A#2 to both the 'Note' and the 'Accent' hi-hat is always closed. Thanks for the information. You say the hihat sounds open when the pedal is down. But when the pedal is up does it still sound open or does it sound closed? In other words, does it seem to be working apart from the fact that open and closed are reversed? Some drum samplers don't support continuous hihat openness and only support fully open or fully closed, for example. Do you know if Drumforge supports many degrees of hihat openness? I tried to reproduce this issue but it's working as expected for me. Would you mind emailing me the drum kit and MIDI map you're using to richard.lee@aerodrums.com so I can investigate further. You can find the drum kit file in "c:\Program Files (x86)\Aerodrums\conf\drumkits\" and the MIDI map in "c:\Program Files (x86)\Aerodrums\conf\midi-maps\". Thanks. Richard wrote: Thanks for the information. You say the hihat sounds open when the pedal is down. But when the pedal is up does it still sound open or does it sound closed? In other words, does it seem to be working apart from the fact that open and closed are reversed? still open sir, but if i just kick the pedal up and down it sounds like normal hihat. Okay sir, i will send you an email asap. but i think it affect only on Drumforge. because on the AD2 it works perfectly fine. Thanks for sending the files. It looks like your 18" crash will send a D3 note and your 15" crash will send a G3 note. From the chart you sent it looks like D3 should trigger "Right crash" and G3 should trigger "Ride tip". Can you tell me what you hear when you hit the 18" crash and the 15" crash? Richard wrote: Thanks for sending the files. It looks like your 18" crash will send a D3 note and your 15" crash will send a G3 note. From the chart you sent it looks like D3 should trigger "Right crash" and G3 should trigger "Ride tip". Can you tell me what you hear when you hit the 18" crash and the 15" crash? in the Drumforge it can 'listening' the midi note. so i set manually to D3 and G3. the crashes are work perfectly sir. the main problem is hi-hat always open sir. If you click on the Options button in Drumforge, are there any presets MIDI maps you can choose from? I would expect to see presets for Roland e-drums, Alesis, etc. Could you try go through these Drumforge presets and then play the Aerodrums hi-hat and see if any of them work correctly.